This year's festival felt a bit different for some reason. Maybe it was the unusually cold, rainy weather. I used to take a bus with my LYS, but they closed this past year so I ventured out on my own Saturday. The weather was a concern since the night before I had put rainbow hair chalk in my newly bleached hair. I was worried I would end up looking like a drowned unicorn, but for the most part it was just misting on and off throughout the day. The illusion was safe. I had thought to give a free guided tour on Saturday but I didn’t get any RSVPs and it looked to be a soggy mess anyway. Also new this year, the festival was charging $5 admission. I admit I thought there would be a big line at the gate, but I had pre-paid using the app and thankfully there was no wait. One thing noticeably missing was the big Maryland Sheep and Wool sign at the gate. I kind of missed it. I feel like the entrance used to be more fun when they had yarn bombing leading up the path. I’m not sure why they don’t do it anymore. A welcoming sight was the Rare Opportunity Bakehouse where I bought some fresh baked cookies. They usually run out pretty fast so I made sure to buy some on my way in. They have some amazing vegan peanut butter cookies and chocolate peanut butter brownies that I went off the sugar wagon for. Baked goods in hand, I made my way up the hill to the Skein and Garment Competition building. This year I entered a couple skeins of art yarn and two photos (for the first time) and I needed to check and see how I did. To my surprise I got 1st and 3rd place ribbons in the art yarn category and a 3rd place for a black and white portrait of a BFL sheep. My first yarn is called “A Walk on the Beach as I Remember it” and the other is “May the Force Be with You”. Both are story yarns that I spun for the Twist Exhibition. The Beach yarn is comprised of a collection of shells and driftwood from a walk with my father last summer on the beach in the town where I grew up. The other yarn represents the themes and hero’s journey in the Star Wars sagas through use of color and symbolism. In a bold move, I turned on the LED lights on my Star Wars yarn that was sitting on the table. I also pulled forward the vintage R2D2 and Chewbacca charms and some of the elements so people could see them. The LEDs represent the light sabers and I wanted people to see the full effect. The white-gloved volunteers guarding the entries must have thought I was a little nutty. But it was meant to be viewed with the dueling lights. One thing I hope they could improve in the future is the display of the novelty/expressive yarns. It’s really hard to see all the elements when it is twisted in a skein and I’d love to see them hanging on the wall displays. Although the fiber art world is making strides with this category, I feel like it’s still not well understood or appreciated as stand alone pieces rather than just material for a garment or larger compilation. Note: On my previous blog, you could leave comments and reader was nice enough to solve the mystery about the shawl: Lynnell Koser wrote the following: "Hi! Love your photos! I recognize the person and the shawl in question you posted. It's Amanda from CloverHill Yarn Store and the shawl is Stephen West's newest pattern, Marled Magic Mystery Shawl." Thank you Lynnell! 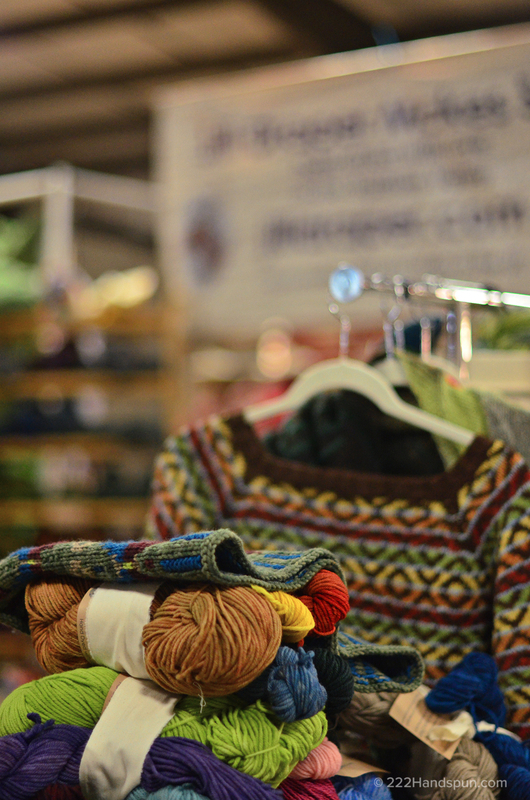 Next stop was the Main Exhibition Hall where I was consigning yarn at Folktale Fibers and Middlebrook Fiberworks booth again this year. Besides dropping off yarn and saying hello, I also wanted to scoop up a skein of Anne’s new line of Vintage No. 2 yarn. It’s a special blend of locally grown 40% Cormo x Merino lamb's wool, 35% superfine Shetland, 15% prime alpaca, and 10% cultivated silk that she hand dyes. It’s beautifully soft and luxurious with subtle light blue color that would go beautifully with just about anything. Another crowd favorite is Loop. I snagged a rainbow center-pull bullseye bump and some loose carded fiber in my favorite hot pink and turquoise colors. I seem to have a collection of these bullseyes that I haven’t spun yet. They are too pretty to spin! Strauch Fiber Equipment - home of the Mad Batt'r. 'nuff said. I stopped by to say hi to the ladies at Solitude Wool in their usual spot in the Main Hall. They were featuring the beautiful Clearview sweater pattern by Amy Herzog in their Coopworth sport yarn. It makes me wish I could knit better. This year, Maryland Sheep and Wool featured Romney sheep so this was right up their alley. 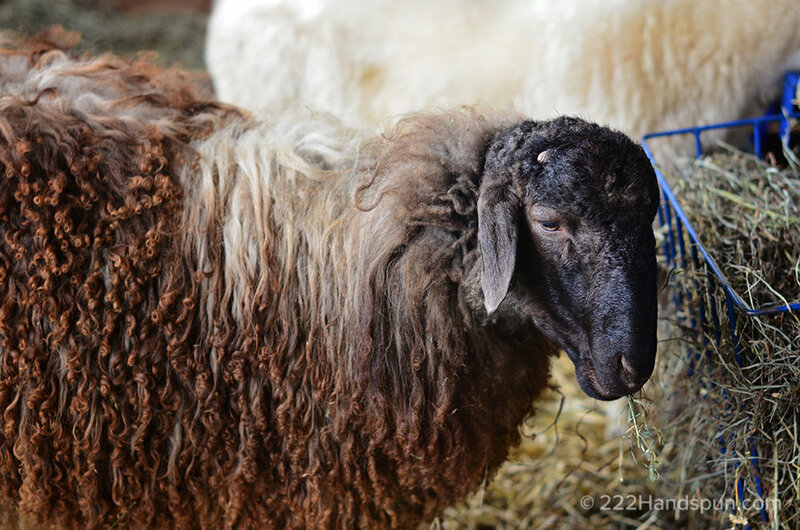 One of the very first raw fleeces I bought was a Romney from Solitude Farm, and I think it’s a nice all around breed that can be used for a variety of projects. 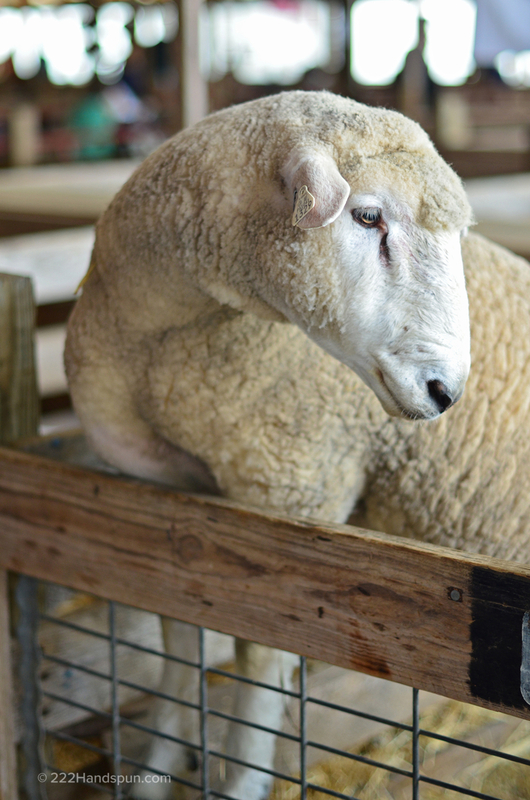 Although classified as a longwool, it is more of a medium staple length and can be pretty soft. 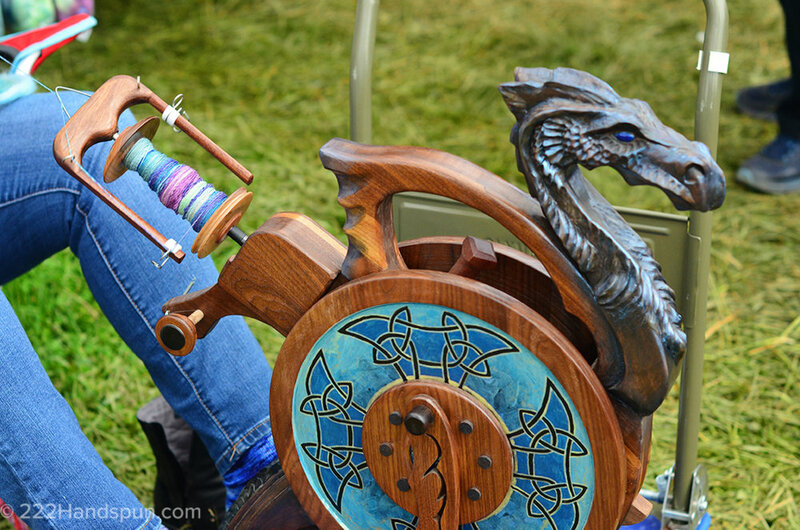 It’s good for new spinners and even better if you haven’t scoured a fleece before because it is not as temperamental or greasy as a fine wool. They’re a cute looking sheep too, ranging in white to various shades of natural colors. 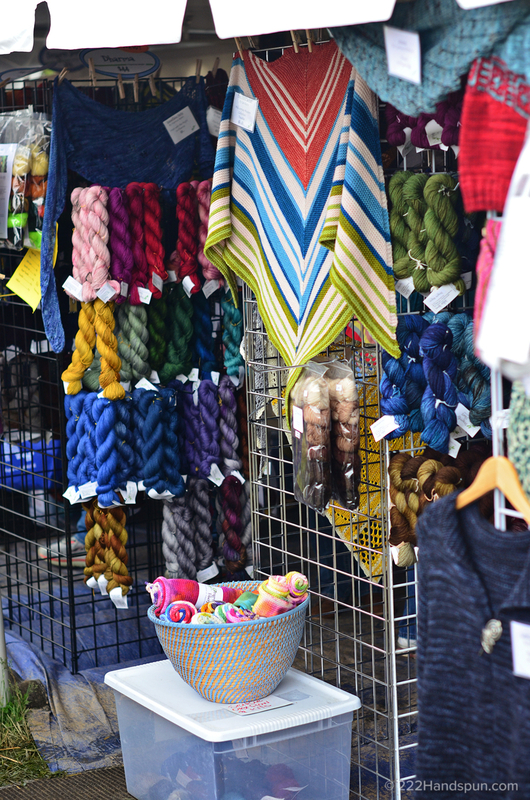 If you get a chance to go to one of their open houses in scenic Northern Virginia, you can see their fiber flock up close and purchase hand dyed yarn made from their wool. My fiber friends Christiane and Melissa were a joy to see at Wild Hare / ThreeRavens. They are so talented and share my love of vivid colors and art textures. After making the rounds at the Main building, I went outside to see some of the outside vendors and sheep in the show ring. Near the main gate is a beautiful booth run by Dalis of Dancing Leaf Farm. She sells beautiful hand dyed yarn and hand felted wearables and is always fun to stop and have a chat with. She was one to appreciate my rainbow hair roots. I passed by some Jacob, Bluefaced Leicester, and other longwool breeds being shown. I was particularly impressed with a young girl who took great care and pride in showing her sheep. She was all smiles and really seemed to be enjoying the whole process. I waited in line for my favorite vegetarian food vendor, Artichoke French. It started to rain but it was so worth it. I googled the recipe and I think I’m going to try to make some at home. After stuffing my face, I had the energy to brave the fleece sales. The crowds had actually gone away and a huge improvement from last year was adding a tent at the back for checking out. There seemed like a lot more room to maneuver and I took some time looking at fleece. I found two Finn fleeces that I loved. They were pretty pricey (this show seems to have prices jacked up a bit) but I thought they were worth the splurge. One was coated and felt like pristine clouds of soft fluff so I knew I’d enjoy washing it. I also bought a white merino that was not coated and I knew would be a little more work. I returned on Sunday and met up with my friend Kristin (August Moon Farm). We made our way to the Main Exhibition Hall. 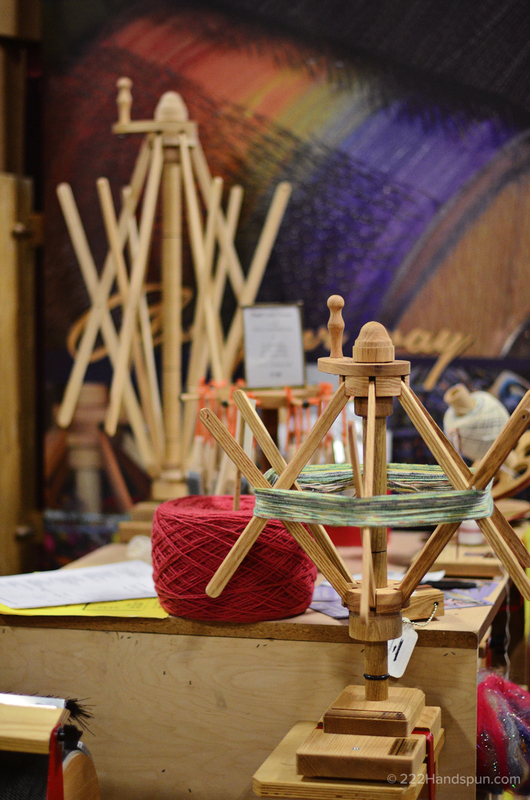 I wanted to buy my first Bosworth spindle and I was sooooo excited. I decided on a small zebra wood spindle that I can travel with. I went to show my treasure at my home base, the Folktale/Middlebrook booth, and Anne did a test drive with some of her fiber. It’s lightweight and spins beautifully. I will treasure it always. I also met up with Jennifer who curated the Twist Exhibition I was in last Fall. She was with her friend, Jolie, who created the other Star Wars story yarn from the show and it was so cool to finally meet her and talk about our yarn. The fiber world is small indeed. I went for a last look around the Main Hall and then headed out to the Lower Corral to stock up on some spinning fiber. Miss Babs was still hopping. Feederbrook Farm has some of the nicest BFL washed locks you can find, so I bagged up a couple pounds (Oops! I had no idea I stuffed that much in there). I use the locks in my art yarn - I just love the little curls. 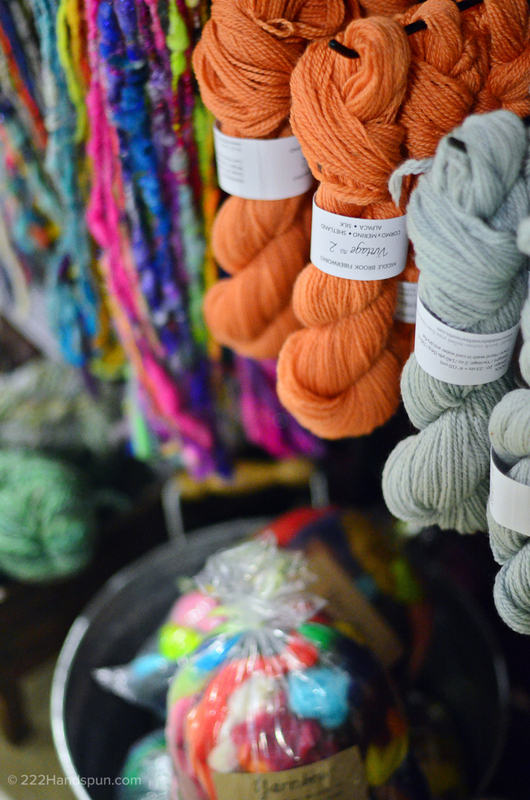 Lisa also sells beautifully hand dyed yarn from her own flock of sheep. I had to buy some rainbow-y battlings at Hobbledehoy to lift my spirits as the clouds were still looming. I’m not sure what I will make with them yet, but it will be super cute no doubt. I waded through the mud a few tents over to say hi to my other fiber friend, Karen of Avalon Springs. Her colors are so amazing and bright and I always just stare in awe and take lots and lots of pictures. I wanted to get see the sheep so I went back up to the barns and saw Martha from Black Sheep Farm and her moorit colored yearling Merino ram, Cinnabar. He was competing for Best Overall Fleece and had already won ribbons for Champion Colored Merino and Best Natural Colored Fleece. I’ve previously bought a couple amazing fleeces from her so I was cheering him on. I think a longwool sheep ended up with the ribbon, but he was my favorite. Also pictured here is Letty (I photographed last year) showing her Karakul ram, Cleatus. One of the more photogenic breeds is Scottish Blackfaced sheep and they seem to always have the best lighting in the barns too. I met another photographer and the woman who raises them and we talked about a visit to see the farm. Their wool is not very soft and is better suited for a rug wool, but they are really beautiful to look at. As I was leaving this sheep was looking to get some handouts. He was the size of a small pony. Thank goodness he didn’t try to break out in earnest. At the end of the day I collected my ribbons and entries from the competitions and headed back home. Another year come and gone by so fast. Where did the time go? Next year I hope to do a better job organizing a trip to the festival. Maybe on the Sunday when it's less crowded? Hope to see you there in 2018!